WARBRINGER - Back in action with new line-up; Touring Asia! WARBRINGER built a reputation for themselves. The Southern California thrash metal band were part of every major tour around the globe for five years straight. In that time it was miraculous that they found time to record four albums of unrelenting aggression. And then it all came to a screeching halt. "I really thought that the Empires Collapse record cycle ended prematurely due to the departure of (guitarist) John Laux and (drummer) Carlos Cruz. I figured it would be the end of the band, and the end of my life's work, as I'd really put everything I had into this band" explains singer John Kevill. "I remember on the last show we played on that US tour (guitarist) Adam Carroll came to me and told me how we had to keep the torch held high and to realize the full potential of the band no matter what. We carried on the following European tour with fill-in members, as we really hate to cancel a gig and let down our fans, but it really seemed like the end for us. Fortunately, though it took a long time, we have been able to find musicians in our area to help carry on the torch of the destructive, intense music this band stands for. So welcome Vicken Hovsepian on drums, Noah Young on guitar, and Alex Malmquist on bass. Our mission since we started rehearsing together was to be the tightest incarnation of the band yet, and to raise the bar and move forward, never back. So far progress has been great and I can't wait to get out there and unleash this new weapon upon the world." After months of intense rehearsal the five-piece is ready to show the world the new WARBRINGER. The campaign starts with an Asian Assault because there's nothing better than flying halfway across the world and debuting your new lineup in front of a huge crowd at the Hammersonic Festival in Jakarta, Indonesia alongside established heavyweights like Lamb of God, Mayhem, Vader, Unearth, and The Faceless among others. This show will be followed by additional headlining dates in the region, an areaWARBRINGER have attacked feverishly before. "We are extremely pumped to return to Asia. It will be our third time over there and we're ready to get back into action and bust some skulls! We've played Indonesia and Taiwan before but this run will include our first visit to China so we're excited for that"states Kevill. WARBRINGER are already putting together plans for US shows throughout the summer in between writing sessions for a next album. The first of these short runs will begin with a pair of shows at the San Diego and Anaheim House of Blues with Meshuggah. Then headliners at the World Famous Whisky A-Go-Go in Hollywood, Thee Parkside in San Francisco and The Spring Meltdown Festival in Reno, NV. "We're looking forward to playing our hometown again after well over a year. We're going to play some songs we have never played live before and seriously bring down the hammer. See you guys there, c'mon and let's wreck the place!" 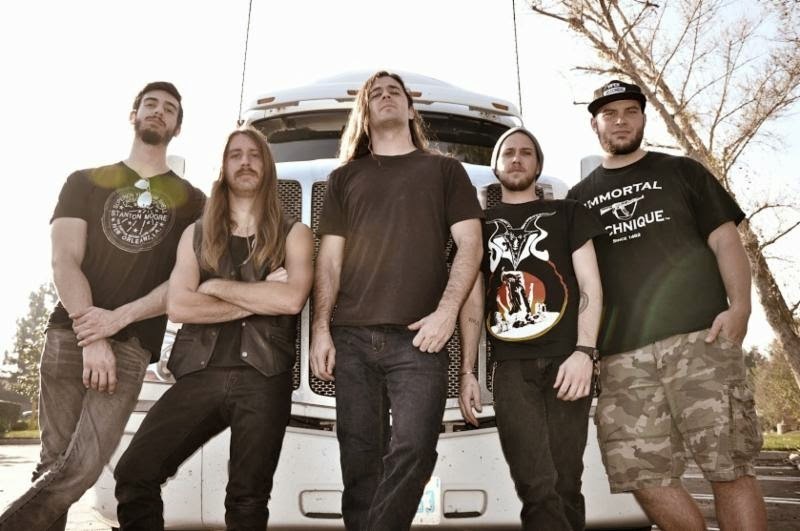 WARBRINGER's 4th album effort IV: Empires Collapse, which was released via Century Media Records in October 2013, was recorded with producer Steve Evetts (Sepultura, The Dillinger Escape Plan, Suicide Silence), mixed by Brett Eliason (Pearl Jam, Heart, BoySetsFire) and mastered by Alan Douches / West West Side Music (Cannibal Corpse, Hatebreed, Converge).